Do you want to get more comments on your Blogger Blogspot blog? Maybe you are wondering why you are not getting the level of comments on your blog that you had hoped for? Well don't panic. Traffic takes time to build and commenting on new blogs is always slow at first. You could resort to creating your own comments but I strongly advise against it. Apart from being unethical I find you can often spot ingenuine comments a mile away and its a major turn off. Instead take heart. In this article I will be focusing on 7 strategies you can employ to encourage your readers to comment and to build a great community around you in the process. To start with let's look at some of the reasons people comment in the first place. I find readers tend to comment on my blog when they have found a solution to a problem or understood something that they haven't known about before. Another reason to comment is that they may ask how to questions especially about technical problems or ask for advice. If I write something contentious readers may post to let me know they don't agree or conversely they whole-heartedly agree. Visitors post comments when they have been moved in someway. Visitors get an impression of your blog the moment they arrive at the landing page. They make up their minds in seconds about the value of your blog. If their attention is grabbed right away by the look and feel of your blog they might hang around and read an article or two. Mostly people are looking for fairly instant gratification so make sure you give it to them by making your blog worthy of visits. It is well documented by other bloggers that readers are more likely to comment if they see that your blog is well patronized and already has some action going on. If it's dead most will leave straight away. Most visitors will not get beyond the first page they arrived at. That's the reality of blogging. However, if your articles are unique and cutting edge in some way then you will capture some of the other 20% who will take more than a passing look. Humans being humans people are more likely to post a comment when they are not the first. Most of us don't want to be first to arrive at a party right and this applies to blogging as well. If your blog is not getting much traffic commenting will be slow too. If your blog is new, say less than a year old, give it time. Once someone comments often this leads to further comments. Make sure you have attended to SEO and created sufficient backlinks to generate site traffic. For visitors to post comments on your blog they have to have some kind of warm up to the content. It's that simple. Make sure you post frequent articles of a high quality. I make it a rule on my blog that I post a response to every comment made. I want people to come back and to know that there is someone there at the other end. A leading 6 figure blogger, Yaro Starak, made the comment recently that he noticed a sharp decline in comment posting when he stopped responding to each individual comment. Respond to comments and your readers are more likely to return and to even comment again. Some readers like to engage and you are more likely to capture these visitors by posting a question on your blog like What's the most annoying thing about Blogger? Tell us about your experince for example. Yaro Starak who makes about $40,000 per month from blogging suggested in a recent newsletter that you not just mention other bloggers in your articles but write an article around them as a way to encourage the other blogger to comment on your blog. Haven't tried this one yet but it is on my list so I will let you know how I get on. If you have tried it already what happened? It is a good rule of thumb to comment on a visitors blog if they take the time to comment on yours. I'm not talking about spamming someone else's blog just writing a comment about some aspect of their blog that you appreciated, admired or interested you. And of course you can get a link back to your blog in the process. Adding a donation button will encourage all those happy readers to say a big thank you for helping them out. Not everyone will donate but you will get the odd generous soul who will willingly donate some chump change to shout you a coffee. In this Blogger tutorial we will be adding a gadget to the Blogger sidebar or alternatively you could place it in the foooter of your Blogger template. We will be using a widget to contain our Paypal Donate Button and will not be changing your Blogger template. If you wish to place the donate button into your Blogger posts see the end of this Blogger tutorial for details. Skill level is rated easy. 4. You now need to select PayPal Website Payments Standard from Merchant Services drop down and then under the buttons in option 1 you will see in pretty tiny writing I must say "There are also buttons for donations and gift certificates." Click on donations. 5. From the Paypal Create a Donation Button screen choose Create Your Button Now link (one of two). If you have burned your Blogger Blogspot blog feed at Feedburner you can easily add a FeedFlare to the footer of the feed. FeedFlare helps you to distribute, inform and create a community around your content. Adding a FeedFlare to the feed of your blog allows readers to select from a range of social bookmarking links which appear at the end of each post. FeedFlare offers subscribers some easy ways to email, tag, share, and bookmark your blog content by linking them with a range of services such as Stumble Upon, Digg This, Facebook, Technorati, del.icio.us and Mixx. It is not difficult to add a FeedFlare to your Blogger feed but it does require you to add a snippet of code to the template of your blog. Don't be put off as I will guide you through this process by providing a step by step walkthrough. This tutorial caters for all levels of technical knowledge from the newbie Blogger to the experienced Blogger. 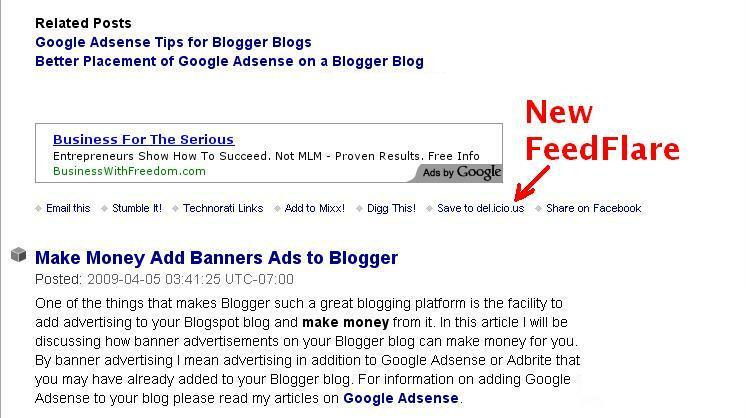 If you have yet to burn your Blogger feed at Feedburner please refer to my articles Blogger RSS Feeds and Feedburner and Burn Blogger RSS Feeds at Feedburner for instructions on how to burn your feed and benefits of burning your blog's feed at Feedburner. 4. To create a simple FeedFlare check the boxes of the options you would like. At a mininum I suggest you select email and comments count (for blogger) in addition to Stumble Upon, Digg This, del.icio.us and Facebook. 6. Click on Activate. Do not close this window as we will be returning here. 13. Return to Feedburner. Immediately below your blog's title and just above the Analyze tab you will see two icons. Click on the RSS icon (left button) which will bring up your blog feed. 14. Scroll to the bottom of the first post and you will see your new FeedFlare in action. For smarter looking links you may choose to customize the FeedFlare's appearance by tweaking the CSS.